This WordPress plugin allows you to build highly customizable PDF documents from any combination of pages and posts, or add a link to any post to download a PDF of that post. This WordPress plugin allows you to build highly customizable PDF documents from any combination of pages and posts, or add a link to any post to download a PDF of that post. The UI is written in JQuery, the backend uses the open-source PHP library, TCPDF, for PDF generation. For source code, more info or screenshots, visit the PDF Creation Station download page at WordPress.org. You can also search for it in your WordPress admin’s plugin repository. 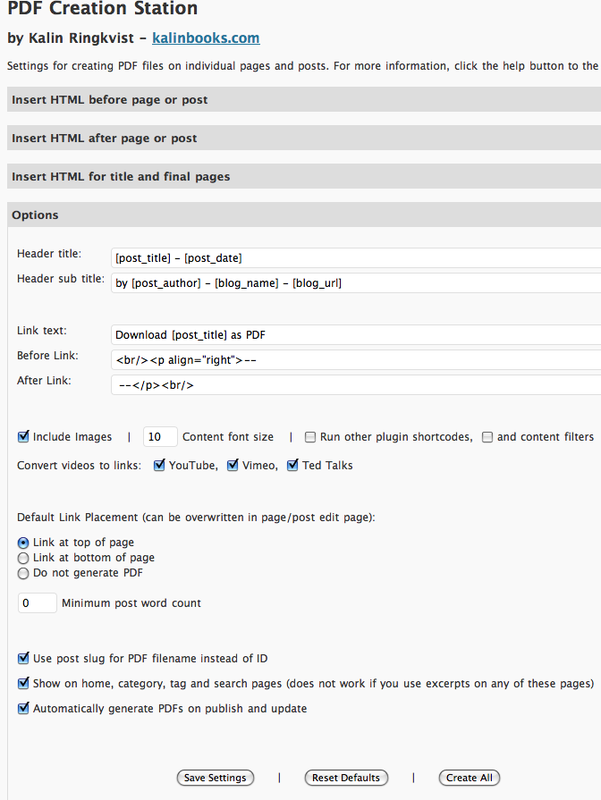 This image is of the settings page that allows you to customize the PDF and the link that is automatically displayed on every post. Not pictured is the Tool page, with many similar options, that allows you to compile numerous different pages and posts into a single, highly customized PDF archive. Also not shown is the HTML insert fields and the list of 20 shortcodes you can use to insert headers or other post data. You may also want to check out a PDF generated by Kalin’s PDF Creation Station. This one is this entire blog up until this point.